This mimic box is made of wood, stained and sealed. The creature is made of premium leather wrinkled and crinkled in all the right places with hand made eyes. The front closure and hinges are in an antique style. He is 5 1/2 inches (139.7 mm) across the front x 5 3/4 inches (146.05 mm) at the tallest point of the rounded lid (6 3/4 inches (171.45 mm) to the top of his tentacles) x 5 1/2 inches (139.7 mm) front to back. A great size for treasures you collect in any world. All my One Of A Kind original pieces are signed by...me, Pippenwyck!!! I hope you like this creature!! He has many brothers and sisters so come visit often. You never know what you might find...Or what might find YOU!!! Greetings Human! This creature is a Mimic, a most mischievous creature indeed! While gathering herbs in the High Mountain passes I had the feeling of being watched. The far away sound of wicked laughter soon confirmed my suspicions as did tree roots mysteriously appearing to trip my feet and tumble me head over bottom. Upon regaining my feet, I quickly hid behind a great Oak with my wand at the ready. It wasn't long before the Mimic Monsters appeared. Quick as a wink I cast a powerful enchantment entrapping this friendly, if somewhat naughty, Mimic Monster! After a bit of discussion, and a few thinly veiled threats on my part, this Mimic agreed to mimic being a box for needful things. Unbeknown to him I’ve placed an enchantment within an enchantment ensuring his current manifestation for many, many moons to come! 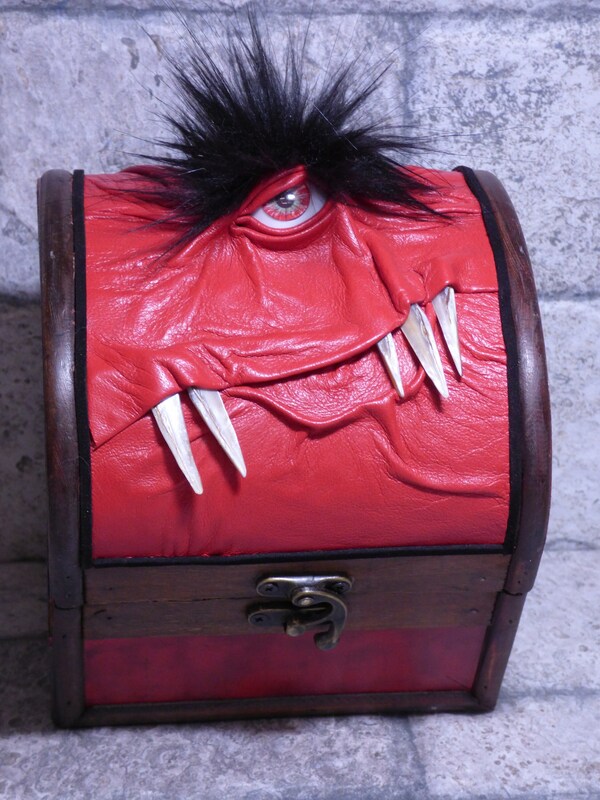 Although he has agreed to provide protection for treasures put within his box he did NOT make any promises regarding mischievous little tricks, deceptions or chicanery!! I would suggest caution and vigilance should this enchanted box come into your possession!! You have been warned!